Two more police officers have been shot in Paris near Porte de Chatillon as a gunman fled to the subway. Police are still hunting for a gunman on the loose. The man opened fire with a machine gun, leaving two officers injured in the Porte de Chatillon area in the south of the city, French media report. The incident happened just after 8AM near a subway station. It happened at the start of the morning rush hour, with an M5 assault rifle believed to have been used. Witnesses saw what appeared to a collision between two cars, followed by two men appearing with the weapon. William Thomas, a 19-year-old who lives close to this morning’s attack, said: “I was woken up by the first three shots. The automatic gunfire was followed by the arrival of numerous special operations police, accompanied by emergency services. A man who appeared to be of North African origin was seen running away from the scene. He was thought to be wearing a bullet proof vest. The second suspect drove away in white Renault Clio. One of the men was arrested, said a local police spokesman. He was described as a 53-year-old. Those wounded were a woman traffic officer from Montrouge, and a male colleague. “Emergency workers tried to revive the woman officer at the scene but she was in a very bad way,” said another officer at the scene. Both wounded officers were described by a police source as being in a “very serious condition”. 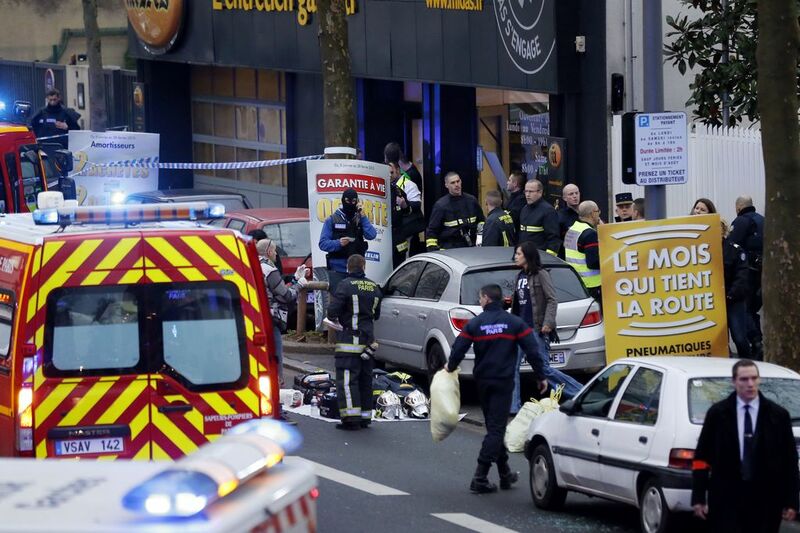 French Interior Minister Bernard Cazeneuve was at the scene and talked to the media. He called on everyone to “keep calm” despite two critically injured victims. He confirmed a shooter did escape the scene. The man is 53-years-old and was wearing a bulletproof vest, and had a handgun and a machine gun, sources suggest. “Around 8:09 he shot towards the police officers who were at the scene for a road incident,” said Bernard Cazeneuve. Reports in France suggest there is currently nothing to link the Chatillon shooting to yesterday’s massacre at the office of Charlie Hebdo magazine.